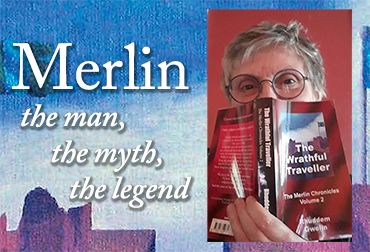 Welcome to the launch of Rhuddem Gwelin’s latest book The Wrathful Traveller – the Merlin Chronicles Volume 2. The evening will begin with some reflections by the author on the role the legendary Merlin has played in the historical battle between magic and the ever-more powerful church. She will then read excerpts from the novel to show how Merlin is cast into the madness of the Crusades. Stay on for drinks, nibbles and mingle with Rhuddem Gwelin and get your very own signed copy of the new Wrathful Traveller and her earlier Merlin novels The Nature of Things and Protecting Cheesyfee. Free. Feel free to follow/RSVP to this facebook-event to give us an ideas of how many of you are coming.